Jenna Halek started selling her goods in February of 2006 after coming across Etsy.com. She was impressed with the look and function of Etsy which opened the doors to selling online. 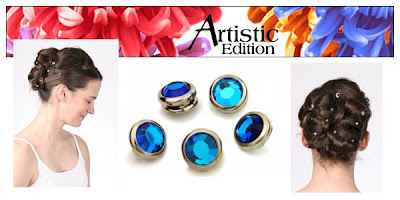 Artistic Edition, Jenna’s shop name, comes from a combination of being artistic and ongoing trial. Jenna’s favorite material is obviously Swarovski Crystals. She makes unique hair snaps at a quality and price that is just unbeatable. When Jenna’s not busy creating you can find her at her day job as a Graphic Designer/Advertising Director for a Quilting Wholesale Distributor. Not to mention coordinating meet ups for our lovely little Minnesota Street Team. You can find Jenna’s hair snaps and other goodies at her Etsy shop and you can join her on myspace to be friends. Stacie Branson started selling You Go Girl! (soaps and more) products at the Midtown Global Market in South Minneapolis. Since then she has sold at craft shows, her website and most recently, Etsy.com. The whole thing started up when her daughter learned how to make lip balm at a camp and wanted to start selling them... Stacie wanted to help form a company for her and did a lot of research. In the process of researching she came across soap making and fell in love with it. So they opened You Go Girl!. 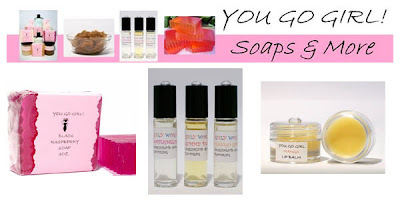 You Go Girl!’s products are unique because of the wide variety of scents they carry and specialized look. Packaging is half of making an outstanding product...You Go Girl! does an exceptional job and often receives compliments on theirs. Stacie’s favorite creation is her Sugar Scrubs. She claims to be not the greatest cook, but loves mixing up scrubs and lotions. She enjoys seeing the response of people who try them. They notice the difference right away and it makes Stacie proud of her work! When she doesn’t have her hands full of Sugar Scrubs you can find Stacie working on her web site and spending time with her family. She enjoys being a Minnesotan and taking advantage of long soothing walks around Lake Harriet. Be sure to visit Stacie’s shop on etsy for great soaps, scrubs, balms and more... and be her friend on myspace. Kristin Larson started selling her jewelry after she became addicted to making it. A co-worker taught her how to make earrings, and she was immediately hooked. Her husband was always been interested in doing a small business, and it seemed like a good way to learn some of the ropes. Kristin believes that what makes a persons crafts uniques is simply the personality that goes into them. Her work is inspired by many aspects of her personality – her love of music, literature, nature, and scripture. Her primary inspiration is nature surrounding the Lake Superior region, where she grew up and stills feel a profound connection to. Kristin’s business name Upon The Waters Jewelry even comes from her true love for Minnesota and it’s lakes. As a teacher by day, Kristin enjoys coming home to craft because it gives her the chance to see the fruits of her labor. She finds so much satisfaction in finishing a beautiful piece of jewelry.... it’s also the perfect way to relieve stress after a long day of teaching 6th through 8th graders and jokes that “beads don’t talk back”.